Here’s something that shouldn’t come as a surprise: Any organisation – be it commercial, government, or not-for-profit – has to pay its bills. And the reason for that is very simple. If, as an organisation, you don’t pay your suppliers, employees or partners on time, chances are you will not survive for very long, regardless of how promising your commercial idea, or how important your role in government, or how noble your goals are as a non-profit. Once your suppliers, employees or partners lose trust in you, you will have problems. That’s why you need a bill approval process. Attempting to consistently pay every single bill on time and in full can be a double-edged sword. You can easily run the risk of overspending by paying bills you didn’t have to pay, or by paying bills more than once. To control that, you need to have a proper process in place for receiving invoices from your suppliers, converting them into bills, and paying those bills on time. 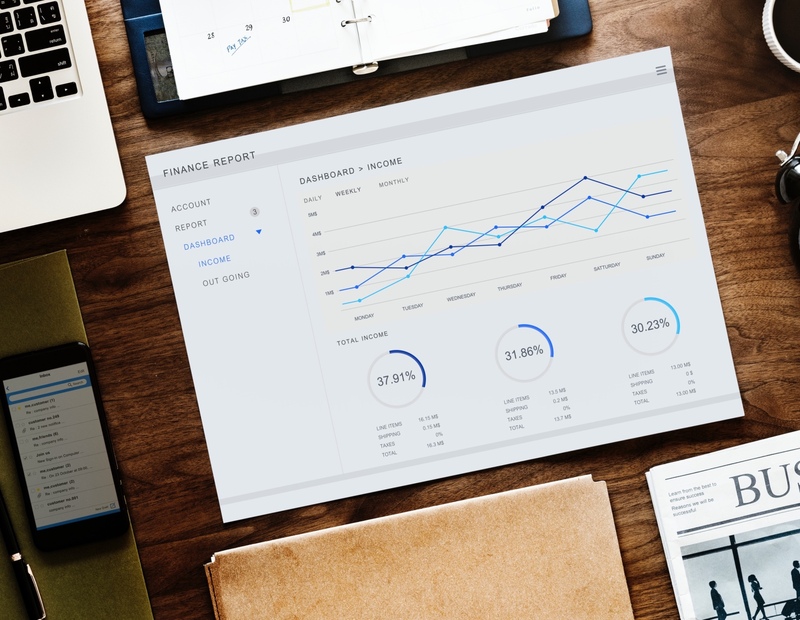 Quite often, the basic process is a manual one, typically driven by email, but this would only work for a very small company, with in-house accounting and a few people making purchases. Once you have more people as part of this process – more people with purchasing authority, especially when they’re in different, remote locations, and/or an outsourced accounting and finance department – the manual process begins to break down. Modern technology and cloud applications, however, enable you to easily establish automated invoice processing. This will take less time, minimise mistakes, and will even allow you to be proactive in controlling your spending. In this post, we’ll show you how this can be done – and how to do it quickly. But first, let’s take a closer look at a typical approval process. (Optional) a formal Purchase Order (PO) may have been issued by an authorised purchaser and stored in your cloud accounting system, such as Xero. Your supplier issues you with an invoice that details your purchase(s). Someone in your organisation, or your financial outsourcing partner, receives the invoice, either in digital or paper form. The invoice is converted into a bill, either manually or by using an Intelligent Data Extraction tool such as Receipt Bank, AutoEntry, HubDoc, Datamolino, or similar. The bill is stored as a draft in your cloud accounting system – i.e. Xero. The bill is reviewed and properly coded by the financial personnel responsible. If necessary, the bill is submitted for approval to specific people within the organisation based on bill type, supplier, cost, and other factors. Once approved, the bill is put into an ‘awaiting payment’ queue with a specific ‘Payment Date’ set. Once the Payment Date occurs, the bill is selected as part of a batch payment and sent for payment. Once payment has been processed, the bill (and any related POs) are marked as ‘Paid’. On converting an invoice to a bill, and its proper coding. On reviewing and approving the bill from a business perspective. These problems can be more severe and frequent if you’re still running this workflow manually or via email. It not only results in low efficiency and long processing times, but it’s also prone to errors and oversights, with shortcuts taken to speed up the process by circumventing or not following the established financial controls. Another method many try is to have all personnel involved with the process work directly within Xero. However, this does not provide much by way of an improvement. In fact, it actually introduces additional risks and issues, the most prominent being that every single person will be able to access every single bill in the system, exposing them to information they are likely not authorised to see – including an individual’s salary and expenses. An effective solution for this particular problem is to centralise and automate the entire process. Provide a single point for your suppliers to send their invoices to (if you use an outsourced financial services provider, chances are they would be the best candidate for that). Digitise your invoices using Intelligent Data Extraction tools such as Receipt Bank, AutoEntry, HubDoc, Datamolino or similar. Establish an automated cloud-based review and approval process with timely notifications, deadline tracking, and a fully automatic audit trail, using a modern tool like ApprovalMax. Establish a bill payment process that includes only bills approved using the formal automated approval process. Your suppliers no longer bombard your managers with invoices, or chase them asking where their payment is. Bills are always properly coded, improving the quality of your data. Bills are always approved by the appropriate personnel. Approvals are monitored to ensure they are dealt with on time. Up-to-date bill status and notifications once a bill has been approved. Full compliance with internal and external business rules. Visibility throughout the entire process. Full audit trails, with instant reporting thrown in for good measure. Payments can be made with confidence since they have passed a formal approval process. 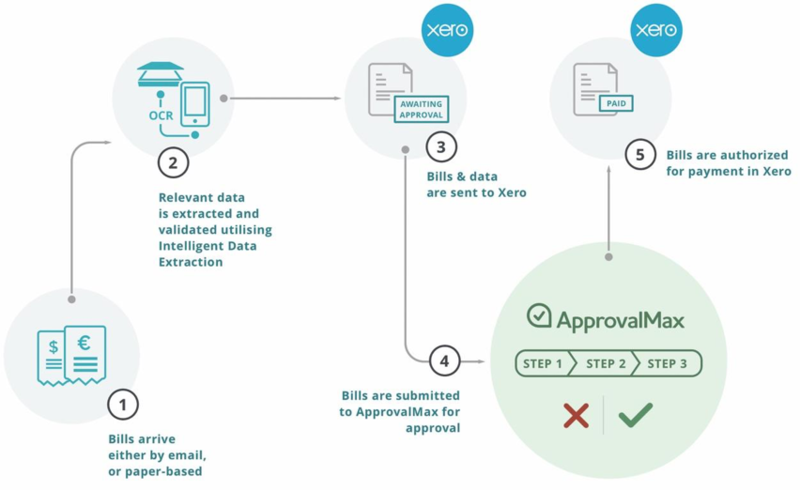 Below is an illustration of automated bill processing in action, using IDE for Intelligent Data Extraction, ApprovalMax to manage the approvals, and Xero as the accounting software. Implementing this process sees data extracted using Intelligent Data Extraction (IDE), before it is automatically pulled by ApprovalMax for approval. Once the bill is approved in ApprovalMax, it is marked as ‘Authorised’ and can be paid either through Xero, or via a payment processing Xero add-on. More bills can be processed with less resource, saving time and money. The approval process is significantly expedited. Compliance with all business rules is ensured. The establishment of a full audit trail, with instant reporting. Use formal Purchase Orders with the appropriate approvals to make sure you’re only ordering the goods and services you need now. Match bills to POs, before checking that the bill matches the PO that was sent to the supplier. Set up approval for the payment of bills in batches. This is the final check before money leaves the company. Making the switch from a slow and cumbersome manual process to a smooth and seamless automated process will elevate the efficiency of your invoice processing to new heights.